Pysolar is similar to PyEphem, with a few key differences. Both libraries compute the location of the sun based on Bretagnon’s VSOP 87 theory. Pysolar is aimed at modeling photovoltaic systems, while PyEphem is targeted at astronomers. Pysolar is written in pure Python, while PyEphem is a Python wrapper for the libastro library, written in C, which is part of XEphem. Pysolar is similar to the sun position module in Sunpy, which is a project focused on solar physics modeling. See, for example, their beautiful gallery of sun image renderings. The Sunpy position module is based on the same algorithm originally described by Jean Meeus, but it appears to omit the later work by Reda and Andreas at NREL that Pysolar uses, or at least the code is shorter. In any case, Sunpy is aimed at solar physics; Pysolar is aimed at modeling solar radiation on the earth. you probably don’t have Python 3. If you need to, you can download Python from the Python.org download page. You can figure out your latitude and longitude from the URL from the “Link to this page” link on Google maps. Find your location on the map, click on the “Link to this page” link, and then look at the URL in the address bar of your browser. In between ampersands, you should see something like ll=89.123456,-78.912345. The first number is your latitude; the second is your longitude. 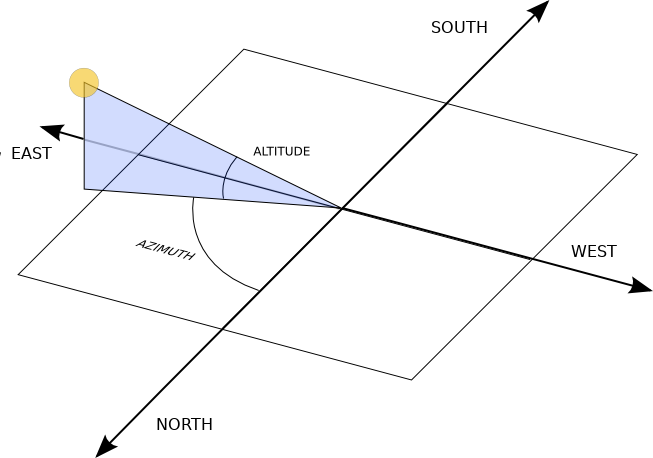 The reference frame for Pysolar is shown in the figure below. Altitude is reckoned with zero at the horizon. The altitude is positive when the sun is above the horizon. Azimuth is reckoned with zero corresponding to north. Positive azimuth estimates correspond to estimates east of north; negative estimates, or estimates larger than 180 are west of north. In the northern hemisphere, if we speak in terms of (altitude, azimuth), the sun comes up around (0, 90), reaches (70, 180) around noon, and sets around (0, 270). If you find yourself getting errors like AttributeError: ‘datetime.datetime’ object has no attribute ‘timestamp’ , this probably means that you are using Python 2 instead of Python 3. Pysolar no longer supports Python 2. If you’re stuck on Python 2 because of some other dependency, you should use Pysolar 0.6, which is the last version that works with Python 2. Note that there have been major changes in naming between versions. In version 7 the function names were changed from CamelCase to lower case with underscores. For example, GetAzimuth became get_azimuth . In version 8, the package name lost its upper-case first letter, so from Pysolar import solar became from pysolar import solar . 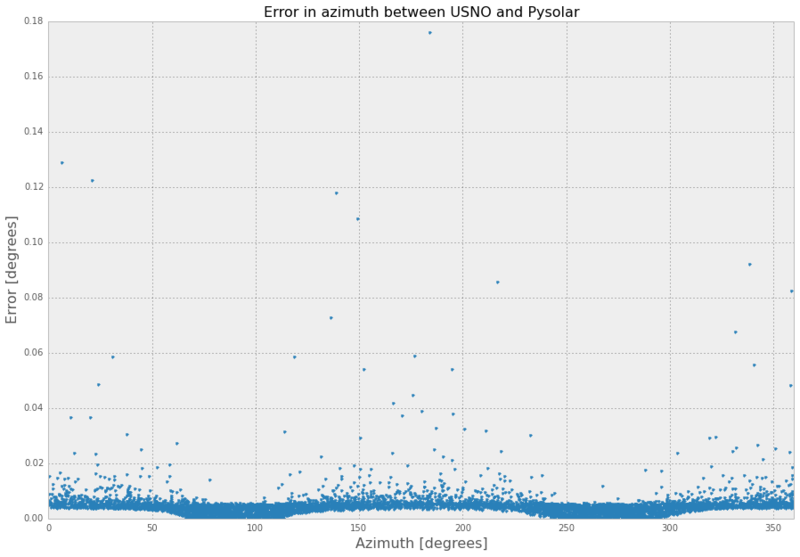 Pysolar has been validated against similar ephemeris code maintained by the United States Naval Observatory (USNO). 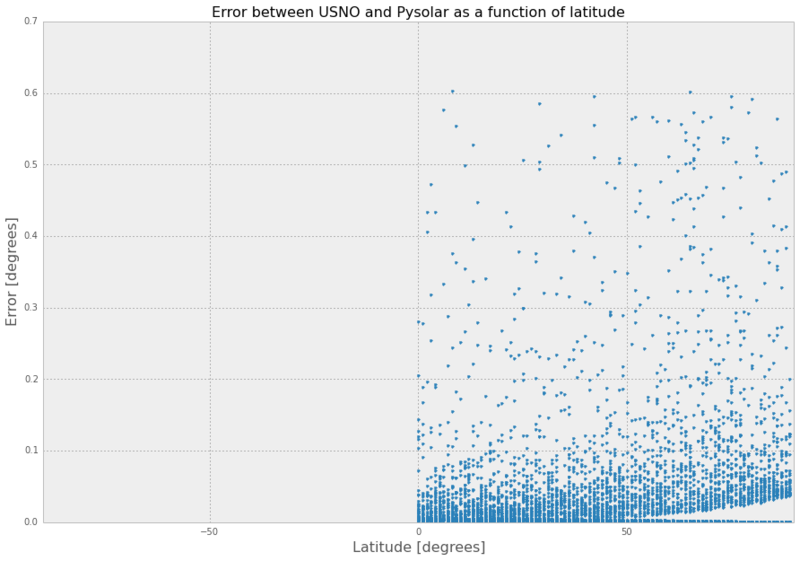 In a random sampling of 6000 locations distributed across the northern hemisphere at random times in 2008, Pysolar matched the observatory’s predictions very accurately. 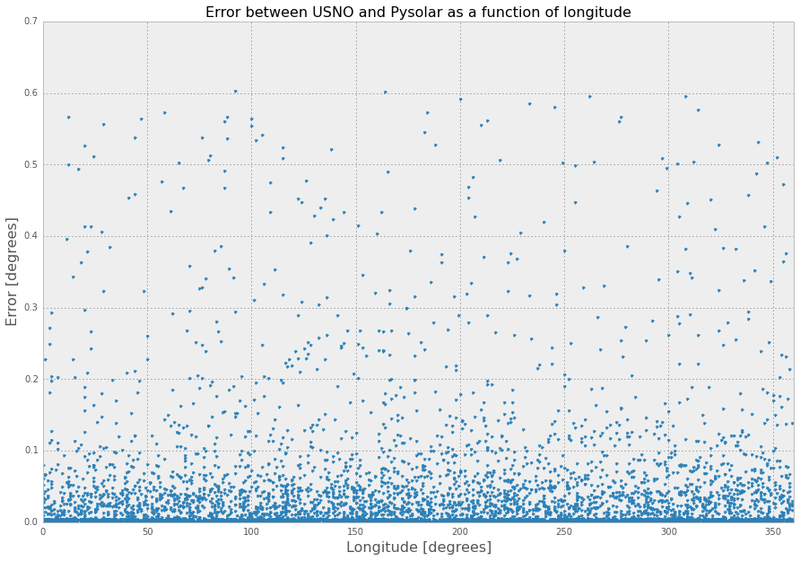 The azimuth estimations correlated much more closely than the altitude estimations, but both agreed with the naval observatory’s to within less than 0.1 degrees on average. Times were limited to 2008 and, to match the USNO’s resolution, rounded to the nearest second. Elevation was limited to sea level to make the search space smaller. The full validation data files are included in Pysolar. See the files: usno_data_6259.txt and pysolar_v_usno.csv. Click on charts for larger versions. Install IPython Notebook, plus a few Python dependencies. Make sure you have installed only the version of Pysolar that you want to validate. Run python3 -i query_usno.py usno_data_6259.txt. 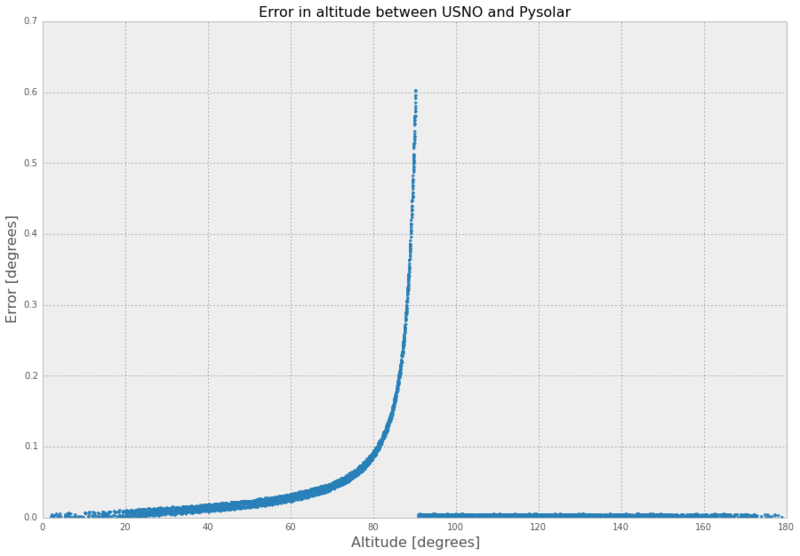 This runs Pysolar’s get_altitude() and get_azimuth() functions repeatedly, compares the results to a file included in Pysolar of data pulled from the USNO website, and writes the results to the file test/pysolar_v_usno.csv. Start IPython Notebook and open validation.ipynb. Run the code in test/validation.ipynb, which will calculate the error statistics and generate the graphs shown above. Abstract 1.1 MB PDF I. Reda and A. Andreas, “Solar Position Algorithm for Solar Radiation Applications,” National Renewable Energy Laboratory, NREL/TP-560-34302, revised November 2005. Online book G. Masters, “Renewable and Efficient Electric Power Systems,” Wiley-IEEE Press, 2004. Abstract 4.6 MB PDF J. K. B. Bishop, W. B. Rossow, and E. G. Dutton, “Surface solar irradiance from the International Satellite Cloud Climatology Project 1983-1991,” Journal of Geophysical Research, vol. 102, no. D6, March 27, 1997, pp. 6883-6910. Many people have contributed to Pysolar since its inception. Thanks to Holger Zebner, Pietro Zambelli, Sean Taylor, Simeon Obinna Nwaogaidu, Tim Michelsen, Jon Little, and Lahmeyer International for their contributions of code, bugfixes, documentation, and general encouragement. Pysolar has been used at several universities, including the University of Oldenburg in Germany, the University of Trento in Italy, and the University of Texas at Austin. It is also deployed in at least one commercial solar tracking system. © Copyright 2014, Brandon Stafford Revision 6980d452.